The Singer/Friden 1162 is a wonderful machine, developed as an integrated circuit-based remake of Friden's first-generation transistorized electronic calculator, the Friden 132. As a result of the use of integrated circuits the 1162 is significantly smaller and lighter than the EC-132, and while still rather heavy, is also much easier to move around than the 132. The 1162 is a stable-mate to the Friden 1160, which is the IC-based remake of the original Friden 130 calculator. 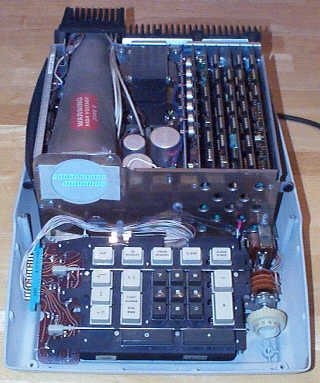 The original Friden 130 provided a four-function calculator with memory register, and the 132 added a one-touch square root function. The 1160 mirrors the four-function capabilities of the Friden 130, and adds a nice sum of products function [X+], while the 1162 replaces the [X+] key with the one-touch square root function of the Friden 132. 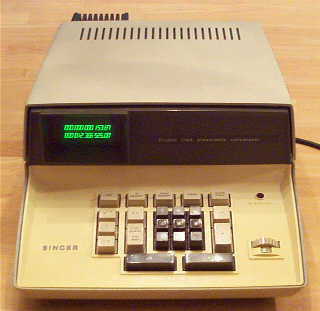 Along with the 1160 and 1162, Singer/Friden offered the Model 1166, a later, lower-cost, calculator targeted at the business/accounting market, with reduced the number of digits of capacity (13 versus 14). The 1166 also features leading zero suppression, a feature that made the machine more friendly for non-technical users. According to pricing information published in early 1971, prices of the 116x-series calculators started with the 1162 at the high-end, with a price of $1195, $995 for the 1160, and $795 for the 1166. The museum has three examples of this machine, one fairly early production machine made in late 1968, and the other two calculators built sometime in the late part of 1969, with these dates based on date codes on various parts of the machines. he 1162 shares the CRT tube display technology used in the earlier 130/132 calculators, but uses a smaller CRT tube (Westinghouse Type 3WP1), and dispenses with the display of all levels of the four-level RPN stack. Instead, the machine displays the bottom two working registers of the stack, leaving the top two registers of the stack invisible. This allows the use of the smaller CRT tube, which further reduces the physical size of the calculator. The digits are "drawn" on the CRT display in a slightly different fashion than the earlier 130/132 calculators. 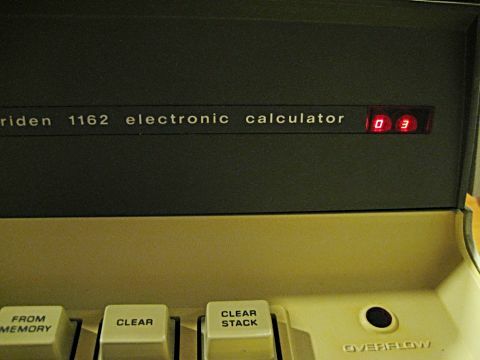 A major difference between the 1162 and the earlier calculators is that the digits on the display are grouped in threes (except while entering a number) to make reading and recording results easier for humans. Oddly, though, the bottom register of the stack, where numbers are entered, does not group digits nor display the decimal point as numbers are being enter. Entering 123.456 shows up as 00000000123456 until the [FIRST NUMBER/CHG SIGN] or a math function key is pressed, then the digits become grouped in threes, and the decimal point is displayed in the selected position. This "blind" input of numbers with no decimal point displayed takes some getting used to as the user must trust that when they press the decimal point key, it is indeed being recognized. The 1162 provides the standard four functions and square root, along with a store/recall memory register. The machine has a capacity of 14-digits plus sign, one more digit than its the Friden 132. Decimal point location is fixed, and is set by a rotary thumbwheel that allows selection of decimal point location from 0 to 11 digits behind the decimal point. The keyboard is a shrunken down and somewhat less robust version of the complex, mechanically encoded keyboard on the Friden 130/132 machines, with keys that lock down (by virtue of a solenoid-activated mechanism) while operations are in progress. The 1162 forsakes the combination overflow indicator/unlock keyboard key of the 130/132, opting instead for a keyboard panel-mounted incandescent indicator that lights to indicate overflow conditions, and use of the [CLEAR] key to reset the machine in such conditions. The 1162 uses small-scale integration IC's for the majority of its logic. Most of the chips are made by Texas Instruments, with a few Fairchild chips sprinkled in here and there. 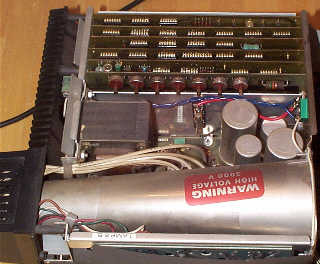 The machine is made up of a mix of early 7400-series TTL IC's (mostly 7474 dual flip-flops), along with TI Small-Scale DTL (Diode-Transistor Logic) chips in the SN158XX-series (Some examples: SN15862[Triple 3-Input NAND], SN15830[Expandable Dual 4-Input NAND], and SN15846[Quad 2-Input NAND]). Along with the complement of small-scale IC's, the 1162 (as well as other machines in the 116x line) use medium-scale integration devices custom made by Texas Instruments for Singer/Friden. The chips consist of part numbers SN1286, SN1287, and SN1288. Each chip implements one of the three up/down ring counters used in the "three-counter" architecture of the machines, carried over from the Friden 130/132. The Singer/Friden 1162 utilizes a total of 93 IC's, along with a significant number of transistors, diodes, resistors and capacitors. The main logic of the machine is spread across six circuit boards which are situated vertically in a card cage, plugging into a backplane made from an etched circuit board. 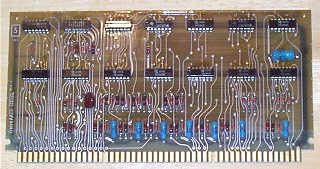 The backplane board also contains some power supply circuitry. 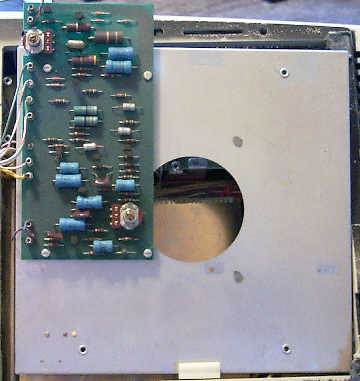 An additional circuit board mounted near the CRT provides high voltage (e.g. : deflection amplifier) CRT drive functions. 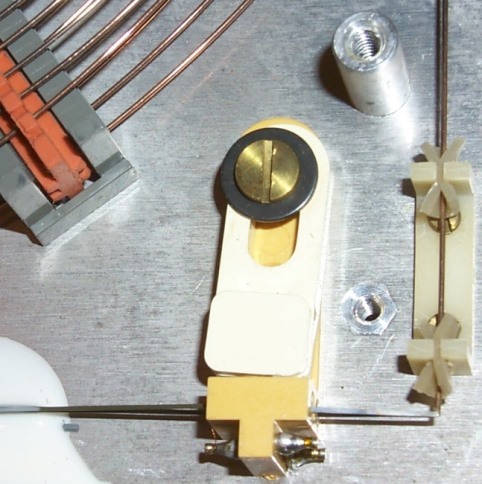 Even though IC's had replaced the all-transistor electronics of the earlier 130/132 machines, the 1162 still uses magnetostrictive delay line technology for storing the working registers of the machine. The delay line of the 1162 is contained in an aluminum housing in the base of the machine, as in the 130/132, but the whole assembly is significantly smaller that its counterpart in the 130/132. The delay line in the 116x-series machines is simplifed in design from that used in the 130/132 calculators, with less mechanically complex transducers and simplified driver circuitry. 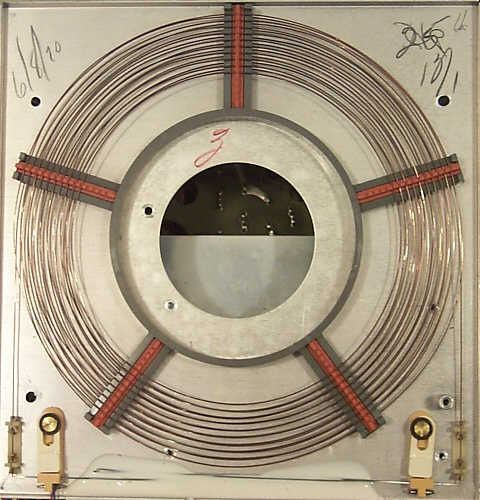 The delay line material is a beryllium-copper alloy wire approximately 40-feet in length, with a smaller diameter than that used in the 130/132 calculators, allowing the overall delay line package to be about two-thirds smaller in volume than the 130/132 delay line. The delay line in the 116x-series calculators has a delay period of approximately 4 milliseconds. The delay line was still needed, as the cost of enough integrated circuits to hold all of the bits required to represent all of the working registers of the machine was simply too high to be cost effective back in the late 1960's. For more information on the way that the 1162 and the 130/132 machines keep track of the registers using magnetostrictive delay line technology, please have a look at the Friden 130 exhibit. The 1162 operates much the same as the Friden EC-132. The keyboard nomenclature differs, but the functionality is very similar. Numbers are always entered into the bottom register (the bottom number on the display) of the stack. The [ENTER] key of the 130/132 is replaced with a key labeled [FIRST NUMBER/CHG SIGN]. This key is a dual function key. The first press enters the number in the bottom register of the stack. A successive press will negate the number. The 130/132 opted for a separate [CHANGE SIGN] key to change the sign of the entered number. The [DUP] key duplicates the number in the bottom register of the stack, and pushes the stack up. The [I] key swaps the content of the bottom two (the registers shown on the display) stack registers. The [TO MEMORY] button stores the content of the bottom of the stack into the memory register (popping the stack), and the [FROM MEMORY] recalls the memory register into the bottom of the stack (pushing the stack). The [CLEAR] key pops the stack, and also serves to clear the "OVERFLOW" indicator, and the [CLEAR STACK] key zeroes out all four registers of the stack. Though implemented with integrated circuits, the 1162 isn't dramatically faster than its all-transistor predecessor. The design of the machine was essentially a re-implementation of earlier Friden transistorized design using IC technology. In practice the 1162 is just marginally faster than the 132. The basic clock frequency of the 116x-series calculators is 2.8MHz, but this fundamental frequency is divided down to 700KHz to make the master clock frequency, over double the clocking speed that 130/132 operate at. In spite of this, the 1162 isn't all that much faster than its transistorized big-brother. All 9's divided by 1 takes a shade over 1 second, and square root operations can take from perhaps 1/4 second to 1 1/2 seconds, depending on the argument. 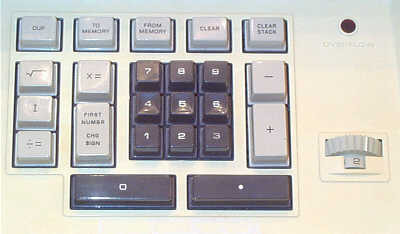 During calculations, the display is blanked, and the function key is locked down until the operation is complete. Overflows physically lock the keyboard until the overflow condition is cleared with the [CLEAR] or [CLEAR STACK] keys. Division by zero results in the machine looping forever with the display blanked and the keyboard locked, with recovery possible with the [CLEAR STACK] key. Extracting the square root of a negative number simply returns an answer as if the argument was positive. After the 116x-series machines were introduced, the next generation of calculators from Friden were designed and manufactured by Hitachi in Japan, with Singer/Friden logos placed on them for sale by the Friden division of Singer. The 1162 and the other machines in the 116x and 115x series calculators are the last of the legacy that started with Robert Ragen's design for the Friden EC-130. Gerard Timmerman, a fellow collector who lives in the Netherlands, has come across an extremely unusual Friden 1162. It has a Friden-made Item Counter built into the machine. 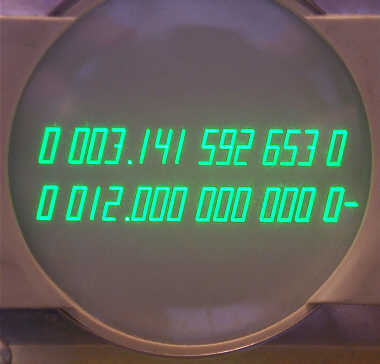 The item counter consists of a circuit board mounted across the front of the machine, to the right of the CRT. 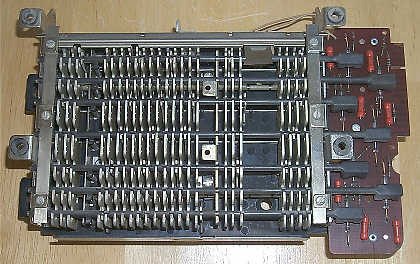 The board has four TTL IC's, and one DTL IC on it that implement a simple two digit decimal counter, with two small seven-segment LED displays that shine through red window in a cutout on the front panel of the 1162 to provide a count of the number of entries made into the calculator. When the [CLEAR STACK] key is pressed, the counter is cleared. The counter is incremented when the [FIRST NUMBER/CHG SIGN] key is pressed, or when a math operation key is pressed (excluding square root). The Item Counter was useful for statistical operations, such as performing averages, as well as for invoicing calculations. The item counter appears to be an add-on, not something that could be ordered on a 116x-Series calculator from the factory. I have not been able to find any documentation on the item counter for the 116x-Series calculator, but the fact that Gerard's machine has the option, and the circuit board for the item counter clearly identifies the board as SINGER Part Number 7016765 Rev 1, is a clear indication that this rare item was a real product. Sincere thanks to Gerard Timmerman for providing the photo of this extremely rare addition to his Friden 1162.